I see a lot of homes in the process of performing home inspections that do not have Carbon Monoxide (CO) detectors installed. In some cases I find that they are not installed properly. If you are installing only one carbon monoxide detector in your home, the Consumer Product Safety Commission (CPSC) recommends it be located near the sleeping area, where it can wake you if you are asleep. Additional detectors should be located on every level and within 10 feet of every bedroom of a home to provide extra protection against carbon monoxide poisoning. It should be noted that carbon monoxide detectors not be located directly above or beside fuel-burning appliances, as appliances may emit a small amount of carbon monoxide upon start-up. Also make sure that detectors are not placed within fifteen feet of heating or cooking appliances or in or near very humid areas such as bathrooms. I often get asked whether it is better to place a carbon monoxide detector at the ceiling or use the type that plugs into an outlet. Carbon monoxide is roughly the same weight as air so it can and may be contained in warm air coming from combustion appliances such as home heating equipment. If this is the case, carbon monoxide will rise with the warmer air. Carbon monoxide is produced from incomplete combustion of fossil fuels. In the home CO can be formed, for example, by open flames, space heaters, water heaters, blocked chimneys or running a car inside a garage. 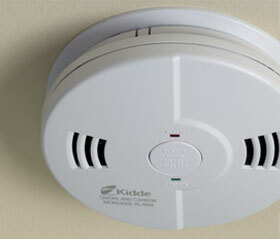 Since CO is colorless, tasteless and odorless (unlike smoke from a fire), detection and prevention of carbon monoxide poisoning in a home environment is impossible without such a warning device. To make sure that we are covered here in the Rochester and Southeastern Mn area, the state of Minnesota passed a law that requires CO detectors in all dwellings. And again, that's every level and within 10 feet of sleeping areas to protect you and your family.